Fall 1995 — The Valencia High School Band & Flag Team marches east on Soledad Canyon Road between Camp Plenty and Whites Canyon Road, in Canyon Country's 1995 Frontier Days Parade. 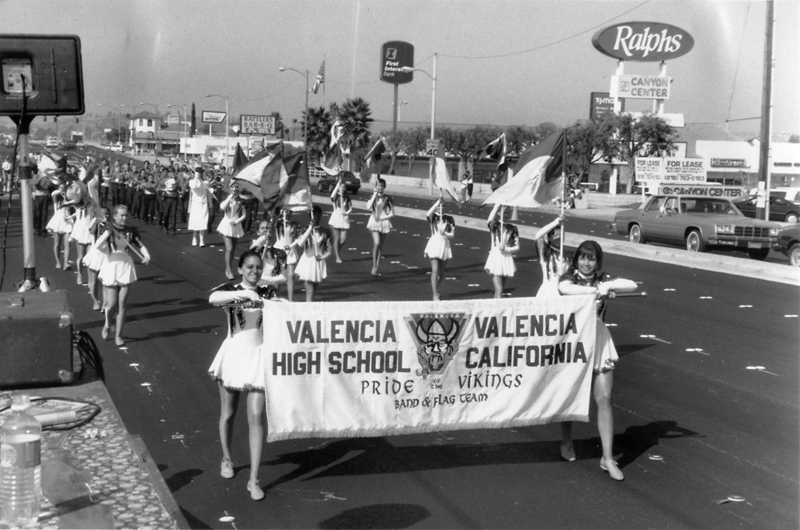 It was the last Frontier Days Parade — and the first local parade for Valencia High, which had opened a year earlier on Sept. 9, 1994. Photo shot from the judging stand. Frontier Days started in 1963 as an annual fall celebration, usually with a parade and often with a rodeo, in Canyon Country — thanks in large part to Arthur E. Evans. Art Evans was a big wheel in Canyon Country long before anybody thought to call it Canyon Country. Back then it was Mint Canyon, which is really the Sierra Highway corridor, which was dotted with places like the Solemint Store and MacDougall's Café and Dillenbeck Market. The cross-town rivalry between Newhall and Saugus (which included Mint Canyon) can't be overstated. As three-time honorary mayor and two-time president of the Mint Canyon Chamber of Commerce — which started in 1956 and incorporated Nov. 29, 1957 — Evans was a huge booster of eastern stretches of the Santa Clarita Valley. In October 1963, Art Evans started the Santa Clarita Sentinel newspaper as a rival to The Newhall Signal, which Scott Newhall purchased that very year. The following month, in November 1963, Evans headed the first Frontier Days celebration. Anne and Ken Lynch, another pair of Mint Canyon Chamber members, are credited with having thought it up. Initially a weekend event, it was held at the Mint Canyon Community Building (which became the Elks Lodge) on Sierra Highway. The early celebrations included donkey rides for the adults, muddy pig wrestling and greased pole contests for the children, and plenty of good hometown cooking. The first Frontier Belle contest, which was also Anne Lynch's idea, started a few years later. In those days, one of the requirements to compete for Frontier Belle was a knowledge of horsemanship. As the event grew and rodeos were sporadically included, the Frontier Belle not only rode a horse in the parade, but also performed on horseback in the rodeo's opening ceremonies. The barbecue was the highlight of the Canyon Country summer. It was then that the Frontier Belle and her court were announced, and planning for the fall celebration began in earnest. Over the years, the Mint Canyon Chamber evolved into the Canyon Country Chamber, and the event was expanded into a three- and then four-day event, moving from the Mint Canyon Community Building to progressively larger dirt lots, empty space being easy to find in those days. As the area grew, the empty lots filled with shopping centers and tract housing. The event was moved to more remote sites near (or in) the Santa Clara riverbed. Those areas, likewise, were soon taken up by condominium and commercial developments (think Jake's Way), and the event had to move again. On July 1, 1995, the cross-town rivalry officially ended, at least in a business sense, when the Canyon Country Chamber merged into the Santa Clarita Valley Chamber of Commerce, which not too many years earlier had been known as the Newhall-Saugus-Valencia Chamber. The SCV Chamber staged the 1995 celebration at the Saugus Speedway — a onetime rodeo venue, but you wouldn't know it from the modern asphalt surface — and in 1996, the event moved across the street to (Valencia developer) Newhall Land's Riverpark property, aka River Village, which at the time was raw land. No longer strictly a Canyon Country celebration, even the date changed — to the four-day July 4 weekend. Except for nighttime fireworks and the morning parade in Newhall (whose 1996 theme was "Celebrating Life on the Frontier" in a nod to Canyon Country), July 4 weekend events in Santa Clarita don't have a good track record of success. You can't draw a crowd. Many people travel, and for those who stay home, the afternoon gets too darned hot. By the time the curtain fell on the 1996 event, the 30-some-odd-year Frontier Days tradition already had been relegated to history. LW2423: 9600 dpi jpeg from original print | BW photo by Leon Worden.